The Scotland from the Roadside Forum has closed, Why not check out the group on Facebook instead! For 2015, Scotland from the Roadside will be producing a calendar with proceeds raised being donated to Scottish Mountain Rescue. 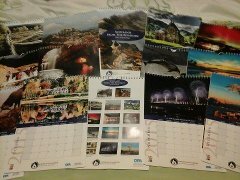 To Australia and New Zealand - £6.50 for one calendar plus £5.00 for each additional calendar. Note the above prices for posting additional calendars is based on up to 5 being ordered; if you want more feel free to get in touch for a more accurate figure. Once you have done all that we should get a note of your payment, your address and the above note. Can you please ensure that your address is up to date! If you don't want to use PayPal then we would accept a cheque. If you wish to use this payment method then please make the cheque payable to Linda Curran and then send either myself or Linda a message so we can pass on our address. Always specify how many calendars you would like so that we can ensure the right numbers are sent out and that we can order more if we need to. Please also make sure you include your full address. To Australia and New Zealand - 30 November. For other payment methods, time will be required for the payment to clear by the above dates to allow us to ensure the calendars are delivered as soon as possible. I hope I have covered everything here, but feel free to ask if you have any questions. The calendar will be produced by Design Print Advertise Ltd in Stirling. Scotland from the Roadside 2002-11 - e-mail southernhighlands/glencoe.htm" with any comments!